There has been widespread criticism of H&F News, the Council’s Pravda style propaganda sheet, ever since it was launched by the Conservative Administration in 2006. Just over a year ago the TaxPayers Alliance attacked the Tory Administration saying "it is incredibly disappointing that, despite the economic downturn” H&F Council has increased spending on self-promotion by a staggering 11.3%. The Evening Standard also rightly slated its £5million expenditure on wasteful PR and last August said Hammersmith and Fulham “may soon become the first borough in Britain covered only by official media”. We live in a free country and should have a strong, free local press. That's one reason why my fellow Labour councillors and I will sell off H&F News and radically cut back expenditure on the Council’s press office and advertising operation should we win the local elections on May 6th. We’ll invest the savings from this and other cost cutting schemes in lower residents’ charges and better front line services, such as crime fighting. Meanwhile, I am pleased that the independent press is fighting back. Last Friday, thousands of residents will have received a copy of the Fulham and Hammersmith Chronicle through their letter box for free. Please click on the photo to expand and view. It has a beefed up editorial team and was packed with local news. It will go to 75,000 homes, each week, across the borough from now on and will offer an independent view. Good! 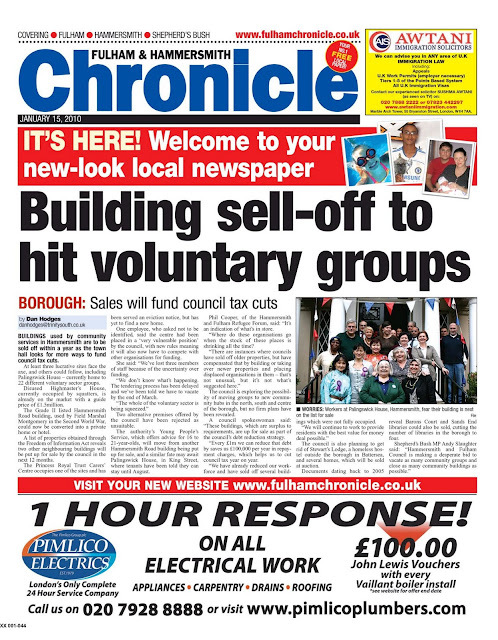 Excellent news about the Chronicle - the first local paper to take the fight to h&f news. The first paper seriously to challenge the one-party, self-promoting Council-owned h&f news.